March 19, 208 5:00 P.M.
Meeting was called to order by Mayor Brian Linin with Vice-Mayor Jay Dee Brumbaugh, Commissioner Annette Fairbanks, and Commissioner John Garcia responding to roll call. Commissioner Jacque Schields was reported absent. Also present were Rich Simon – Public Works Superintendent, Joni Showalter-Police Chief, Sami Philbrick- Museum Director, Alex Weis- Code Enforcement, Brian James- Fire Chief, Dustin Bedore- Electric Superintendent, Sharmis Blake- Deputy City Clerk and Andrew Finzen – City Manager. Unfit Structure: 1619 Kansas Ave. – Mayor Linin opened hearing at 5:00 p.m. Andrew stated, public hearing was set by Resolution 1515 at February 5th The Resolution sets a time and place at which the owner, the owner’s agent, any lienholder of record and any occupant of the structure may appear and show cause why the structure should not be condemned and ordered repaired or demolished. There was no public comment, Mayor Linin closed hearing at 5:01 p.m.
New Police Officer Introduction: Nichole Stegman – Joni introduced new police officer, Nichole Stegman to the Commission. ON A MOTION by Commissioner Fairbanks to approve Consent Agenda seconded by Commissioner Garcia. MOTION carried on a VOTE of 4-0. Resolution 1522: Unfit Structure 1619 Kansas Ave. – Andrew stated, this property is under investigation for potential arson so property owner is not able to make improvements to property even if willing and able. We would not be giving them reasonable time as required in code. Commissioners should postpone action on this resolution until County Attorney grants a release of this property. James Carver property owner stated, I bought property in December. My plan was to demolish structure and clean up property. ON A MOTION by Commissioner Garcia to table Resolution 1522: Unfit Structure 1619 Kansas Ave. until property is released by the County Attorney seconded by Vice-Mayor Brumbaugh. MOTION carried on a VOTE of 4-0. Bid Award: 2018 Pest Control Services – Andrew stated, bid opening was held March 14th for pest control services for various City properties. We received two bids: Pest Away, LLC in the amount of $4,740 and Tri-State Exterminating in the amount of $4,660. Commissioner Fairbanks asked, are both businesses local? 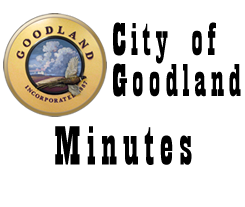 Richard Winter, owner Pest Away, LLC stated, I own a home in Goodland, with a local office and phone number. Matthew Wahl from Tri-State Exterminating stated, I am from Goodland but business owners live in Colby. ON A MOTION by Commissioner Fairbanks to accept the bid from Pest Away, LLC in the amount of $4,740.00 seconded by Vice-Mayor Brumbaugh. MOTION carried on a VOTE of 3-1 with Commissioner Garcia casting the dissenting vote. City Manager Report – 1. Master Gardeners received a $3,300 grant for north berm at Gulick Park. As a reminder, the Commission Retreat is March 27th at 5:00 p.m. in Commission Room. 3. Joni and I are working on a False Alarm Ordinance and will probably talk about it at the next meeting. 4. The idea of having Pickle ball at Chambers Park will go to the board for review. 5. The City received the public transportation grant which includes a new van and $1,200 towards getting IPad’s to dispatch the bus. 6. County Commission agreed to help with clean up week by waiving fees for everyone in Sherman County to haul waste to landfill, excluding tires and concrete, the week of April 9-13. Museum Director – Sami discussed current and upcoming exhibits. At the end of the month we will have the block exhibit, then in April we are partnering with Ground Water Management District and local Soil Conservation office in Exploring Sherman County Nature. On April 17th we have a weather night and then in May we will have a Science Olympiad Exhibit and Cemetery tours. Area museums are working together again on the passport program. Public Works Director – Rich stated, we have been working on water leaks from old service lines. Some Water Department personnel will be attending KRWA meeting last week of March. We have been working on the Welcome Center and doing maintenance at Water Treatment facility. Police Chief – Joni discussed job descriptions, responsibilities and services provided to the community by each of her personnel. Commissioner Garcia – 1. We need to contact State to update striping on Highways 24 and 27. Commissioner Fairbanks – 1. Thanked Department Heads for their presentations. Commissioner Schields – Absent, No Report. Vice-Mayor Brumbaugh – 1. Thanked Department Heads for their presentations. Mayor – I talked to some of the County Commissioners who appreciate the offer made with CVB and Economic Development. 2. I also appreciate Department Head presentations. Under authority of K.S.A. 75-4319 (b)(6) for a preliminary discussion relating to the acquisition of real property – Commissioner Garcia made a motion at 5:55 p.m. to recess into executive session under authority of S.A.75-4319 (b)(6) for preliminary discussion relating to the acquisition of real property not to exceed five minutes. I request the Commission and City Manager be present. Commissioner Fairbanks seconded the motion. MOTION carried by a VOTE of 4-0. Meeting resumed at 6:00 p.m. Commissioner Garcia made a second motion at 6:00 p.m. to recess into executive session under authority of K.S.A. 75-4319 (b)(6) for preliminary discussions relating to the acquisition of real property for two minutes. I request the Commission and City Manager be present. Commissioner Fairbanks seconded the motion. MOTION carried by a VOTE of 4-0. Meeting resumed at 6:02 p.m.
under the authority of K.S.A 75-4319 (b)(2) for consultation with an attorney for the body or agency which would be deemed privileged in the attorney-client relationship not to exceed twenty minutes. I request Commission, Jake Kling, Alex and Brian be present. Commissioner Garcia seconded the motion. MOTION carried by a VOTE of 4-0. Meeting resumed at 6:30 p.m. Commissioner Fairbanks made a motion at 6:30 p.m. to recess into Executive Session under the authority of K.S.A 75-4319 (b)(2) for consultation with an attorney for the body or agency which would be deemed privileged in the attorney-client relationship not to exceed twenty minutes. I request Commission, Jake Kling, Alex and Brian be present. Vice-Mayor Brumbaugh seconded the motion. MOTION carried by a VOTE of 4-0. Meeting resumed at 6:50 p.m. Commissioner Garcia made a motion at 6:50 p.m. to recess into Executive Session under the authority of K.S.A 75-4319 (b)(2) for consultation with an attorney for the body or agency which would be deemed privileged in the attorney-client relationship not to exceed twenty minutes. I request Commission, Jake, Alex and Brian be present. Vice-Mayor Brumbaugh seconded the motion. MOTION carried by a VOTE of 4-0. Meeting resumed at 7:10 p.m.
ADJOURNMENT WAS HAD ON A MOTION by Commissioner Garcia seconded by Vice-Mayor Brumbaugh. Motion carried by unanimous VOTE, meeting adjourned at 7.15 p.m. A special meeting is scheduled for Tuesday March 27, 2018. The next regular meeting is scheduled for April 2, 2018.